Kelly Taylor has less than year to live. A 30-year-old terminally ill woman is to launch a legal battle to force doctors to end her life. Kelly Taylor, from Bristol, who has been given less than a year to live, wants doctors to increase her medication to induce a coma-like state. Mrs Taylor, who has heart and lung and spinal conditions, has also made a "living will" asking doctors not to provide artificial food or hydration. Her doctors have refused her requests, saying it amounts to euthanasia. Mrs Taylor's lawyers plan to use part of the European Convention on Human Rights which bans "inhuman or degrading treatment" to argue in the High Court that she should not be refused steps which will end her life. A full hearing has been scheduled for the end of March. But the British Medical Association said that giving morphine with the deliberate intention of ending someone's life was "unlawful and unethical". 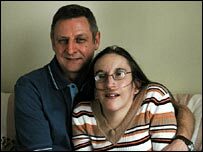 Although other terminally ill patients have gone to court to argue their right to die, Mrs Taylor's case is thought to be unique, as her solicitors are combining two arguments to try to force a change in law. They will argue doctors have a duty to provide her with adequate pain control, even if that hastens her death - a decision known as the "double effect". Doctors may give morphine or other medication to relieve pain or distress which may have the effect of shortening life - a situation called the "double effect"
But they will also ask for her living will to come into force once she is unconscious from the effects of morphine. Her cardiologist, palliative care consultant and GP have refused to increase her medication to a level which would result in her entering deep sedation. She has tried to take a paracetamol overdose on a few occasions and last year she stopped eating but it became too painful to continue. Mrs Taylor who has Eisenmenger's syndrome and Klippel-Feil syndrome, told the BBC she was in immense pain. "I don't want to be looked after any more. I want to assert my own independence," she said. "I don't really understand why I'm here. I go from day to day just making it through the day. I don't want to be here." Deborah Arnotts, chief executive of Dignity in Dying said: "Mrs Taylor is in an intolerable position. "Her case highlights the impossible dilemma that the current law presents to patients with terminal illness where pain relief and palliative care do not work to relieve their condition." Mrs Taylor's solicitor Richard Stein of Leigh Day & Co Solicitors, said: "We don't consider that we're asking for anything unlawful and the courts we believe will come to that conclusion too. "The only way she can be free from pain is if the doses are increased to the level where she loses consciousness." A spokesperson for United Bristol Healthcare NHS Trust said: "Mrs Taylor's doctors have spent much time with her discussing her requested treatment options. "The primary responsibility of all doctors is to determine, in consultation with a patient, the treatment that is in that individual's best interest and that is within the boundaries of the law and professional clinical standards." In January last year, retired doctor Dr Anne Turner, from Bath, travelled to the controversial Dignitas clinic in Switzerland to end her life. The option of travelling to one of the Swiss clinics which offer terminally ill patients the ability to commit assisted suicide had been rejected by Mrs Taylor. She did consider the option but then became too ill to travel. And believes she should be allowed to die at home. Euthanasia is a crime in the UK, as is helping someone to kill themselves - known as "assisted suicide". Assisted suicide differs from euthanasia in that a fatal dose of drugs is not administered to the patient by another person, but they are given the means to do it themselves. A spokesperson for the British Medical Association said: "While we sympathise with Mrs Taylor's situation, we cannot support her request for doctors to sedate her, to a state of unconsciousness, with the specific intention of ending her life. "In our view, this would involve the doctors in assisting her suicide, which is both unlawful and unethical." Dr Peter Saunders, campaign director for the Care Not Killing Alliance said: "This is a very sad case but what is really needed is not a change in the law to allow lethal injections but access to the highest quality of palliative care to those who need it."